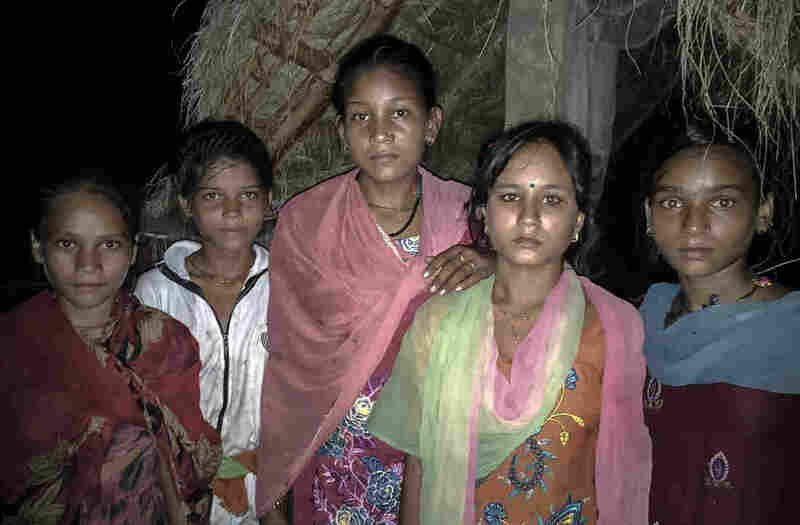 A Girl Gets Her Period And Is Banished To The Shed: #15Girls : Goats and Soda When a teenage girl in rural Nepal gets her period, an ancient tradition may drive her to sleep outdoors. But one 15-year-old is trying to break the taboos around menstruation. Kamala B.K. is tiny. She's barely 5 feet tall. A bright red ribbon sets off her dark hair. As she walks past our guesthouse in the village of Thankot, we try to get her to come over and talk to us. But the 14-year-old won't come over to the porch. "Because she's menstruating, she should not be entering another person's house. It's disrespectful," says Cecile Shrestha of Wateraid. The nonprofit is working with girls and women in western Nepal to end a tradition called chaupadi — that's held them back for thousands of years: "When they are menstruating, no matter what, they stay outside, they eat outside and they sleep outside," Shrestha says. Outside in sheds. In Kamala's village they consist of a raised platform, with no walls, some have thatched roofs. Kamala tells us she'll sleep in one of those sheds tonight. We ask her to come closer to talk, but she covers her face with her hands and won't move. "She's scared we are going to beat her," Shrestha says. Because stepping on to the porch would break a menstrual taboo. Kamala believes that if she enters the house while she's menstruating, the people and animals will get sick. The gods will be angry and she'll bring a curse onto the house. She's also been told her hands will curl up and become deformed. We try to reassure Kamala that no one will hurt her, but she's scared and runs away. Three hundred miles away in the capital city of Kathmandu, we visit a completely different world. 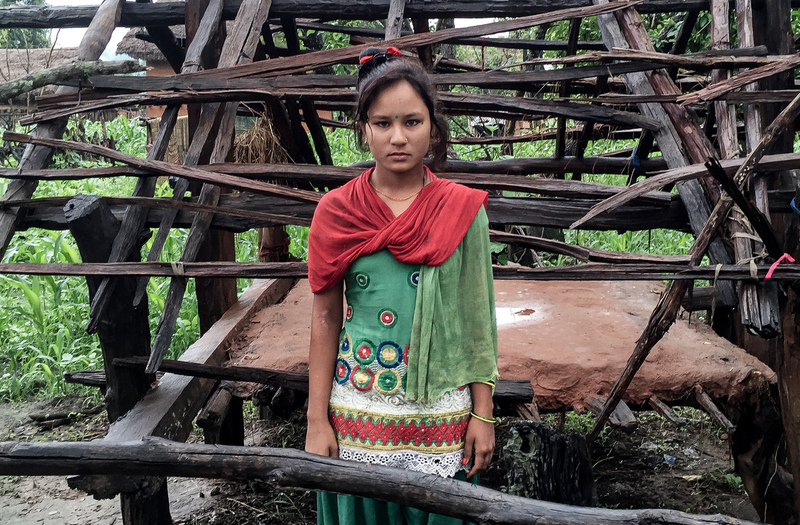 Prakriti Kandel is 15. She's studying for her SATs. And with short hair and black-rimmed hipster glasses, Prakriti already looks like a college student. Prakriti is very close to her parents. She sits next to her mom on the couch and often puts her head on her mom's shoulder. 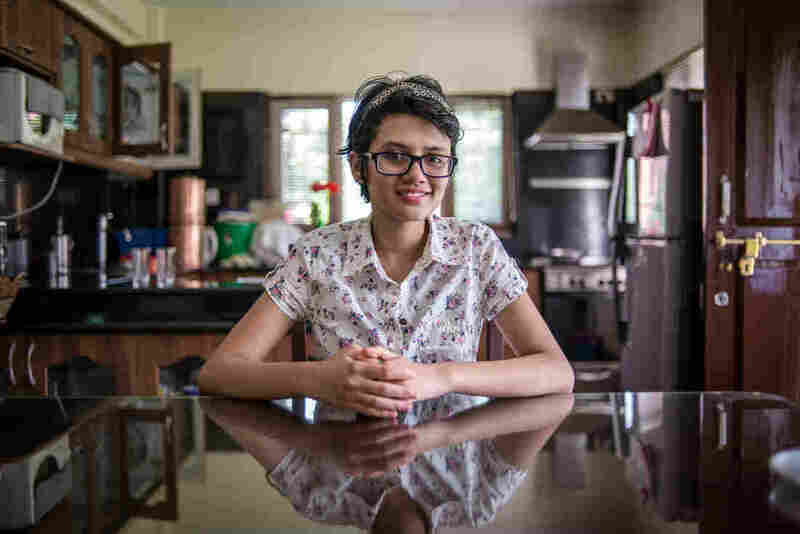 She says her dad has always supported her goal to go to college abroad — even though many girls in Nepal don't get to go to college at all. "He was the one that said it was fine having one daughter, that he didn't need a son," she says. "He is always inspiring me in my life." But Prakriti's family also puts restrictions on her when she's menstruating. "When I'm having my period, I can't touch my grandmother, I can't eat while she's eating. I can't touch the table while she's eating. I can't touch my father, I can't touch my mother," she says. She also can't go into the kitchen. But she forgets. "It's kind of confusing. You are just going into the kitchen one day, and the next day you're not allowed." 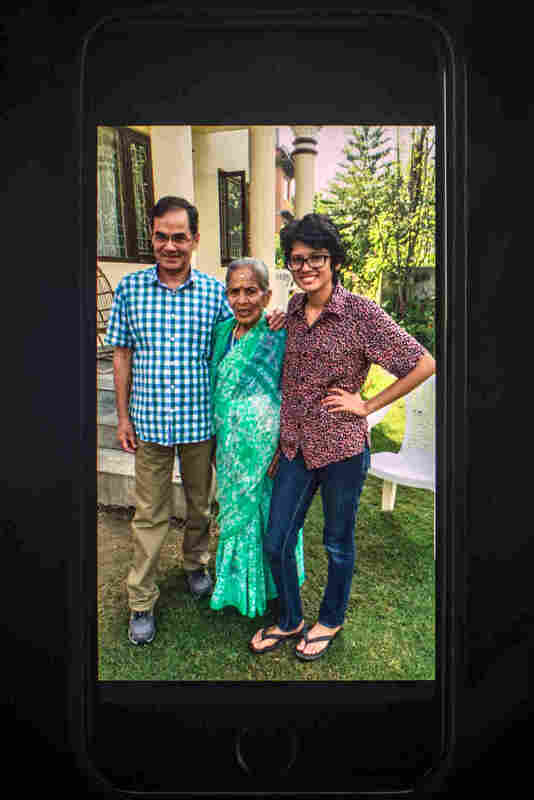 Prakriti fights with her mom and grandmother a lot about this. Sometimes she storms off to her room and cries. Because she doesn't follow the rules, Prakriti gets blamed for awful things. "There was a time when my father got sick, and he was hospitalized," she says. "The doctors couldn't diagnose him, and then one of the priests, he said, because I had touched him when I was having my period, it could have infuriated the clan gods." So the priest blamed Prakriti for her dad's illness because she had touched him while she was on period. Ancient Hindu scriptures say women are highly infectious during their periods, that "all her body is so weak that viruses come out of her mouth and her limbs," says Mukunda Aryal, who has studied Hindu culture for 40 years. In Hinduism, there was once a king of the gods, who reigned above others. This god, called Indra, committed a horrible sin. And to atone for it, he created menstruation. Now each month, women suffer for this god's sin. They're impure, dirty. There's even an expression in Nepal that women say when they're on their periods: "I am now untouchable." These taboos date back thousands of years and pervade nearly all cultures and religions, Aryal says. For example, in Christianity, women on their periods were once thought to be dangerous. In some places, these taboos still hold on. For ultra-Orthodox Jews, the laws forbid any contact between men and women. Out in Nepal's western villages, these ancient rules are more than just a nuisance. The next night, we find Kamala, and she agrees to take us to her shed. It's about a ten minute walk. It's starting to get dark, and she doesn't have a flashlight. "I'm scared mostly of snakes and of men," she says through translator, Pragya Lamsal of WaterAid. Kamala has heard stories of girls being sexually assaulted when they're alone in their sheds. Her shed is shocking. It looks more like a cage — with wooden bars crisscrossed over the top and sides. It's monsoon season and the rain is torrential. Kamala has a piece of plastic to drape across the top of her shed but she still got drenched. Kamala was 11 when she first started her period and she remembers being terrified when she first slept outside. The shed is small, barely big enough for her to lie down and sometimes she shares it with 2 or 3 or more girls and so for most of the night they squat. "I don't feel good about practicing this," Kamala says. 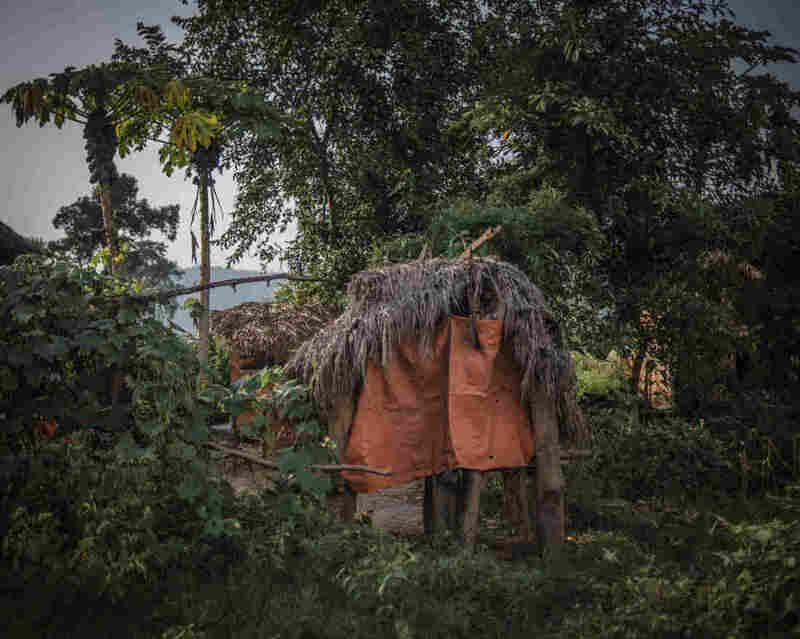 The Supreme Court of Nepal outlawed the practice in 2005 so it's illegal to force women into these sheds, but many villagers in the remote west continue to do it. Kamala says she can't break her community's rules. But in the capital Kathmandu, Prakriti is determined to change them. After the priest blamed Prakriti for her father's illness, she went to work. She learned about the biology of menstruation. About how other cultures around the world treat it. Then she had an epiphany: "Menstruation is not a taboo, but a power for women." She felt so strongly about this issue that she wrote a novel, called Imposter. It's about a society where menstruation gives women superpowers. Men are afraid. "They ostracized women, so they couldn't unleash their power," Prakriti says. Prakriti starts laughing while she reads her book because her mom makes fun of her ideas about menstruation. But Prakriti is serious. Her goal in life is to stop menstrual taboos — and all the discrimination and abuses that go with them. "Because of this belief, because of this ritual, women are not equal to men," she says. "So this is just a way of discrimination, and discrimination always hurts," Prakriti says. She's already got a plan to stop this discrimination: "After school, I want to pursue political science at a very good college. And my aim in life is to be the prime minister of Nepal and change things." And to get Kamala and all the girls in rural Nepal out of their sheds.